Jason: This is Jason Black, joining you guys back for another great episode of the Louisville Custom Builder podcast. Got a special guest joining us today. 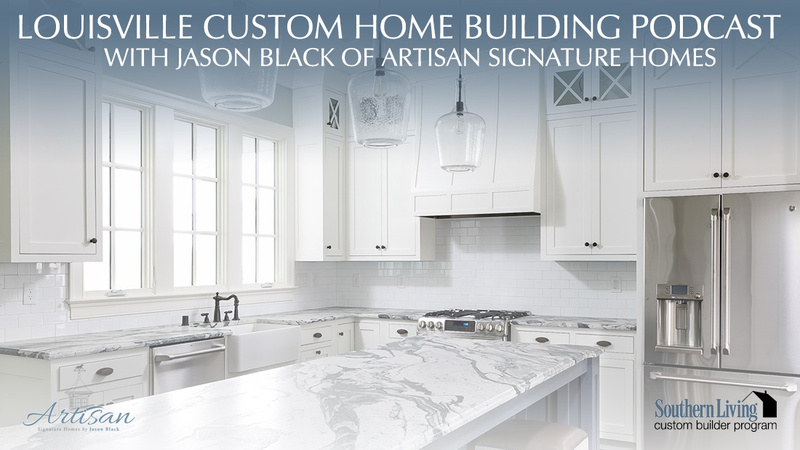 Jimmy King is a new member of the Artisan Signature Homes team, who I’ll introduce here in just a few minutes. But I’m going to steal the microphone for just a second and share with folks that when I set out to start the new business of Artisan Signature Homes last year I knew that I couldn’t do everything by myself. In order to have a successful company, you have to have a successful team. One of the key members of the team that I am thrilled to have joining me is Jimmy. It’s early into January 2016. He’s joining the team, and just wanted folks to meet him, get to hear his voice. I’m going to talk a little bit about his background and why he chose to join Artisan and what he brings to the table. Let you guys into a little behind the scene of how we build such a beautiful home. With that, I want to introduce Jimmy and have him tell a little bit about himself, and then we’ll get right into the details. Jimmy: Well, thank you, Jason. I tell you, I’m happy to be here. It’s exciting. I’m looking forward to a great 2016, and it’s exciting. We’ve got a lot of exciting things coming up and going on, and really just thrilled to be here with Artisan, so I think we’ve got a bright future. Jason: I’ll give folks a little background. Jimmy and I have had the pleasure of working together for, gosh, almost 10 years prior to him joining Artisan. We went to high school together, and have a long-standing relationship. One of the reasons I’m happy to have Jimmy join us is, he’s a man of integrity. He builds such a wonderful, well-detailed house that it really is going to set Artisan apart from the other builders, when people see the fit and finish of our home. With that being said, Jimmy, let’s talk a little bit about what makes a successful home. From maybe a customer’s perspective, what can they expect, or how can they better enjoy the process of building a custom home. Jimmy: The first thing, I think, is when we start the process we explain to the homeowners how the process is going to work. When you have clarity on the way the process is going to work and the steps, and how the communication is going to be handled, I think it gives the homeowner a lot of reasons to be excited about the process and the different steps as the home is constructed. I think that clarity puts them at ease, if you will, on … Okay, I feel good about knowing how the process is going to work, what’s going to happen next, and the communication. I think that makes for a successful experience with a homeowner. Jason: I’ve always said that anybody can build a house. It is true. Anybody can build a house. But it’s really the process of … It’s quite an enjoyable experience. Most of our clients have worked most of their adult lives to save up enough money to build a luxury custom home that we do here at Artisan. I want them to enjoy the process. You hear the horror stories about builders and no communication and not being involved. That’s what we do a little bit different here, is communication is key. We’re a customer … although we build houses, it’s a customer service business, and with got to make the customer happy. We’ve got to deliver what we say we’re going to deliver, and let them enjoy the process as we go through it. With that being said, Jimmy, do you have any advice you could give a potential customer who may be thinking about building, what to tell them when they’re getting ready to venture into that process? Jimmy: I think always ask the questions. There’s no stupid or silly questions. Ask away. So we can clarify things for them, clarify the process, clarify any questions they may have. That’s one of the things I try to pride myself on is just helping the customer along through the process and guiding them through that process, so it’s an enjoyable experience. Jason: Yeah. No, I think that’s great. We touched on communication a little bit, and I think with Jimmy joining Artisan, one of his strongest suits is communication and customer relation skills. He was in business for 10 years before he got into building custom homes, and he was in the customer service business. I think that background really helps put the customer at ease. Jimmy and I have worked together building probably 200 plus custom homes. Every single customer that Jimmy worked with just totally loved the experience, and the first class persona that Jimmy is really came to the table with that construction knowledge. Why don’t you talk a little bit about maybe some tips you could give a customer when we’ve started the building process, how to make it more successful for them. How can they be better prepared when we get into building a home for them? Jimmy: Well, one thing I think is key is making your selections, and having hose done early on in the process. I think it just allows for a smoother process. Once your selections are finalized, from a production standpoint, it helps us, as you know, allow us to move forward for a more timely build, if you will. Jason: Well, I think one of the nice things that we do here at Artisan is, there’s a lot of great social media sites like Pinterest and How’s, and there’s magazines. But a lot of our customers know what they want, but sometimes they have trouble expressing that. We pair every single one of our customers up with one of our interior designers. I think having that person that can oversee the process, and oversee all the selections, really helps the customer feel like their vision is going to be carried out in their new home. Jimmy: That’s without question. I think that when they feel like they have a guiding light, if you will, through the process with a selection coordinator, assistant designer, I think it makes the process go a lot smoother. Jason: I couldn’t agree more. Again, I think having a successful team together is what makes for a great custom home. Talk about, Jimmy, the features you think people are looking for in today’s homes. Jimmy: Well, I think they really are looking for livability. When I say that, some functional floor plans, and so forth. But specifically, they want to see a nice trim, and that million dollar feel, if you will, in maybe not a million dollar home. But I really think they want to see nice products such as the trim. Jimmy: Exactly. When you have a beautiful, nice kitchen, beautiful cabinets, custom cabinets, and your granite countertops, and beautiful trim package, it just really, I think, sets us apart. Jason: I couldn’t agree more, Jimmy. Well, it’s a pleasure having you join the Artisan team. Thanks for coming out for the podcast today. I know we pulled you out of the field. You’re busy putting some new holes in the ground, which is always exciting. It’ll be more projects for us to talk about and give our listeners a chance to see here in the near future. We’ll be back next week for another great episode. We’ll talk to you then.